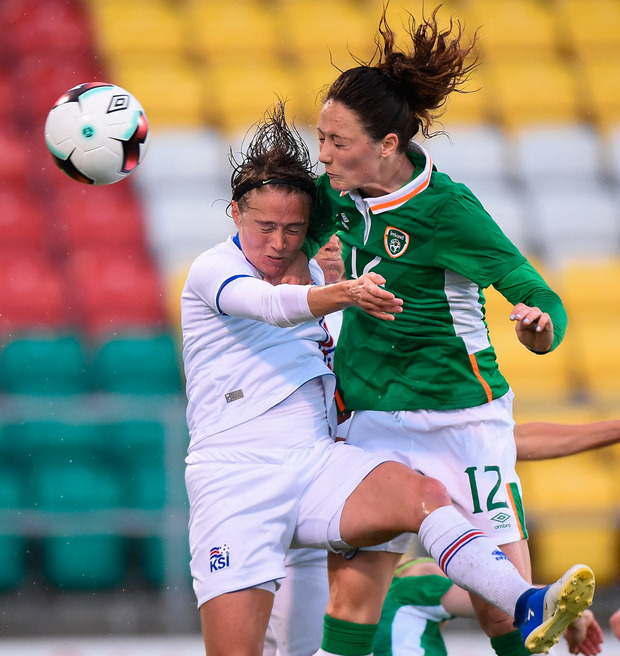 Ireland's growing reputation as being difficult to beat was enhanced last night as they held Euro-bound Iceland scoreless at Tallaght. Dreadful weather conditions militated against flowing football, though both teams tried in vain to string passes together. Since Colin Bell took charge in February, he's amassed a record of just one defeat in six but an improvement is still required to break Ireland's qualification drought. 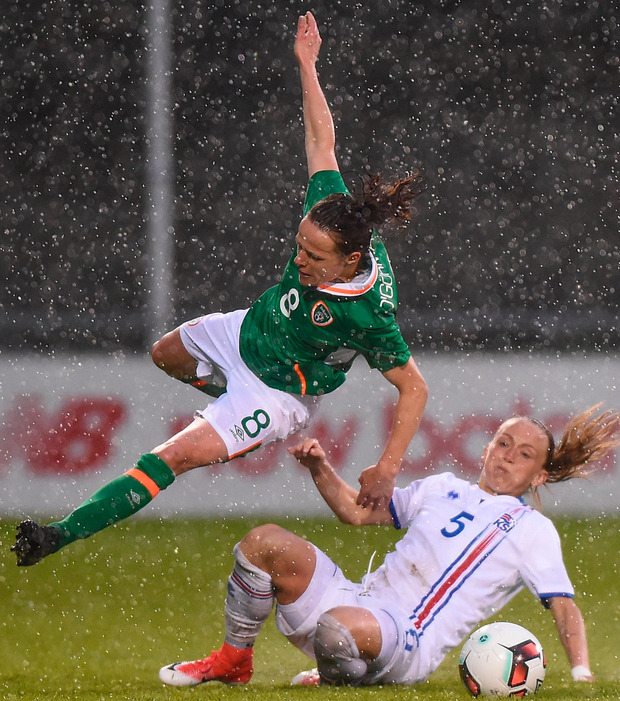 Perhaps the Girls in Green missed the presence of injured Stephanie Roche, and are still struggling to discover a successor to the retired Fiona O'Sullivan, but they lacked punch up front once again. Indeed, their best chance of a scrappy game fell to centre-back Diane Caldwell on 65 minutes but she couldn't turn her close-range header past goalkeeper Sandra Sigurdardottir. 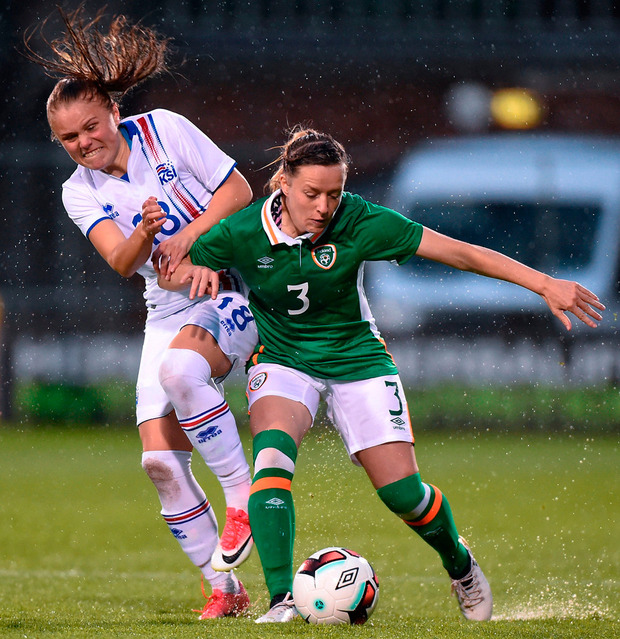 Megan Campbell, playing her first international for 15 months, showed how much she was missed by connecting with Aine O'Gorman's corner midway through the opening half without applying the necessary power to test Guobjorg Gunnarsdottir. Iceland came closest to nicking the win on the hour mark. Katrin Asbjornsdottir swivelled brilliantly inside the box to connect with a corner but her rising shot was clawed away by the outstretched hand of substitute goalkeeper Marie Hourihan. Ireland - E Byrne (Brighton ); S Perry (Brighton ), L Quinn (Arsenal), D Caldwell (SC Sand), H Scott (Reading); K McCabe (Arsenal), K Duggan (UCD Waves), D O'Sullivan (Houston Dash), M Campbell (Manchester City); M Connolly (Florida SU), A O'Gorman (UCD Waves). Subs: M Hourihan (Manchester City) for Byrne (46), N Fahey (Chelsea) for Connolly (73), C O'Riordan (Wexford) for Campbell (81).